Soup Supper is Back. Bring the Entire Family!! 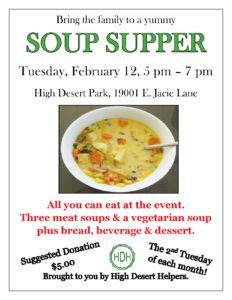 - High Desert Helpers, Inc.High Desert Helpers, Inc. High Desert Helpers, Inc.Soup Supper is Back. Bring the Entire Family!! - High Desert Helpers, Inc.
Soup Supper – February 12th, 2019 5-7 pm. $5.00 donation suggested. Three soups to choose from, plus vegetarian. Beverage and dessert included!